I have always been fascinated with the paranormal since I was a child. In fact the spirit realm may be one of the few things I do believe in. I thought I would reveal my experiences. When I was about 3 or 4 I started hearing voices in my pillow when I went to bed. Usually it would start as a whisper and it would be 2 voices talking to each other. Most of the time it was a man and a woman. It was odd because I would lift my head up off the pillow and it would stop. Most of the time these two voices would be fighting over something and I knew it wasn't my parents because the voices didn't sound like them. One night it got so bad and violent that it didn't stop when I lifted my head off the pillow. I was like two people fighting in my room. After that my parents moved me into a different bedroom. They told me it was probably just the neighbors fighting next door but I really don't believe that. So when I moved into the other bedroom, the fighting voices stopped but a new voice started talking in my pillow. It was a woman and she would say my name and that was it and this happened almost every night. It didn't scare me, it felt normal. Once I moved out of that house, the voices stopped altogether. 2. When I was about 4 or 5 living in the same house that I heard the voices in my pillow. I had an experience that I will never forget. Sometimes at night after my parents went to bed I would get up and sneak into the kitchen to go through the cupboards and draws to play with all the kitchen stuff. I'm not sure why but it entertained me. So it was dark except for the hall light was on and I could see everything but everything did cast a shadow. So I'm facing the wall and playing on the kitchen floor and all of a sudden I see something moving. I look up at the wall and there is a huge dark shadow of a man standing behind me. At first I thought it was my father and I looked behind me and there was nothing there and I looked back at the wall and the shadow was gone. So I ran to my room terrified. I told my sisters about it the next day and they told me that my Father was probably playing a trick on me. I still don't think that's true though. 3. When I was about 5 or 6 I had this odd experience that I'm not sure to this day if it was real or a dream. So I wanted to sleep on the couch bed in the patio room. I didn't want to sleep out there alone so my mom slept next to me on the bed. That night I woke up heard noises coming from the corner of the room where the fireplace was. I looked over toward the fireplace and I saw movement. At first I thought it was a rat or some kind of rodent but these creatures were walking on two legs and had arms and pointy ears and their eyes were reflective. I would say there were about 5 of them just climbing up and down this fireplace. I was terrified and I was trying to wake up my Mom and she just wouldn't wake up. I shook her and yelled at her and she just wouldn't wake up. Then finally she woke up and these creatures just disappeared. She told me I was just having a bad dream and to go back to bed. I never slept out there again. Maybe I was dreaming but if I was it was the most vivid dream I have ever had. 4. When I was about 16 years old, my Aunt past away. About 6 months after her passing I had an odd experience. I had this music box that she had given me and I kept it on top of my dresser. I hadn't turned it on in years. Then one night around 2 or 3 in the morning I woke up and it was playing. I laid in bed for a few seconds and sat up it just stopped. I wasn't really that scared for some reason. It never happened again. 5. When I was 19 I moved in with my boyfriends family. They lived in a small mountain town called Julian. They had two trailers on the property and my boyfriend and I lived in separate trailers because his family was really Christian and they didn't feel it would be right to be living under the same roof because we weren't married. We still snuck into each others trailers when they weren't watching though. Any ways my boy friend and I would go meet other friends in the woods at night to go smoke cigarettes because we couldn't smoke around his parents. Those woods were strange. You always felt like you were being watched. In the mornings I had to get up at 3 am to go to work and I had to walk to the main house from the trailer to take a shower. Every time I stepped out of that trailer and walked to that house I felt like I was being chased by something I couldn't see. I never saw anything in those woods but I found out later that my boyfriends Mother's sister saw a cloaked figure with no face on the property. 6. When I was in my 20's my husband and I were living in an apartment. I always felt uncomfortable in that apartment. If my husband wasn't home I would sleep with the light on. Nothing had happened but I just felt uncomfortable. One night my husband was in bed with me and the lights were off but there was light shining from the window from the street lights. I was sleeping on my stomach and my head was faced towards the window. I noticed the vertical blinds were swaying back and forth and this confused me because the windows were closed. So I thought maybe it was the cat. So sat up to look at the floor near the blinds and see this small black ball of light kind of moving in and out the bottom of the blinds. It almost looked like a sea urchin but translucent. It was almost like this thing realized I was looking at it and it got scared and disappeared. Nothing else happened in that apartment. 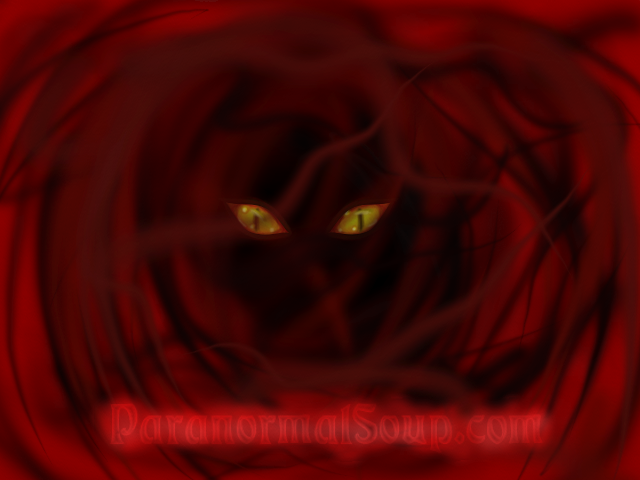 I have had no more major paranormal events happen in my life since my 20's. I have had feeling in some places I have been but nothing significant has happened. I guess that's a good thing. Some times I miss it though. I miss experiencing the possibility that there is more to life after death. I miss having faith in something. We are all a little insane lol, you'll fit in.